What kind of landlord are you trapped with? Renting tales: Every one of us has a story to tell of our landlord/landladies…those fond of house-hopping have probably seen these people in all forms. What kind have you…or is it, what kind are you? Finally, March saw the best of us, April decided to welcome its Monday with a fool’s day. What do our bosses expect us to make of this April? Imagine being in a meeting, your boss is boiling with anger, churning out a list of actions on a Monday morning. The silly part of your brain is wondering: “Is this a joke? Is he pulling a prank?” The end of the month also announces the start of a new one. The most hyper-active people are the landlords and ladies, their presence is more pronounced now more than ever. It also means that the “Uganda Rent Defaulters Association” has to innovate more convincing excuses, stories of goods stuck at the border, a blocked bank account, name them all. It is confession time, that moment we categorise these landlords and ladies, so that each can find their ilk. 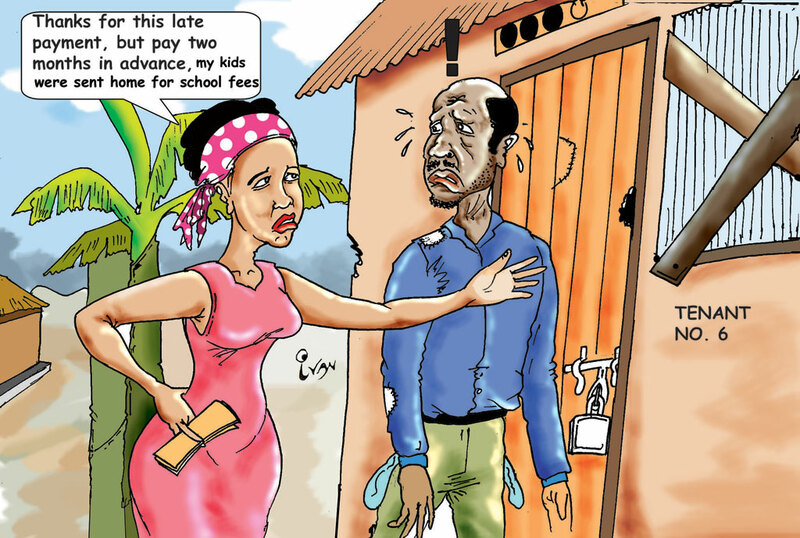 Here are the different types of Ugandan landlords and ladies. If God ever curses you with one beating as a tenant, let it not be of a stay at home landlord. It is the equivalent of having the roving eyes of a parent. These ones will know you in and out, from the girlfriends you bring around, to the food you eat. You basically cannot cook beef until you have sorted their rent. How do you even blast music at high volume with this type? The first rule of renting is as simple as never living close to your landlord. Avoid this temptation at all costs. With all the struggles of adulting, you do not want to pile it up with a big brother. If you rent in Kisaasi, make sure your landlord lives as far as Entebbe. Lies are easier to convey over the phone. Otherwise, how will you recite the Ugandan proverb of the ka-small money you are expecting. Landlords should never count as neighbours! These kind of landlords admire the formality and legalese of the law vendors. They see everything through the eyes of documentation, they want a signature on everything. The moment you spot them, then head out to a stationery shop, stock some file folders, reams of paper, a counter book, and pens. You are going to be signing lots of things, you are going to be filing many of these in the course of your tenancy. It always starts with the rental agreement. Then comes the rules and regulations. Your signature will be appended on each of these. It will all happen in the presence of their lawyer. Then you will have to deposit the money on their account. They are the type of landlord that requires you to pay a month of security. It is said as you are leaving, this extra month will be used to pay up for all the damages in the house. If you have a lawyer landlord, get your own lawyer. Serve them a share of their own medicine. The moment Umeme misbehaves, serve them with an intention to sue. If you notice cockroaches roaming around, once again, threaten to sue. We all have had the kind of landlords that do not want to see people visiting you or even spending a night. They disguise it as a security risk. They do not want tenants with children. You can only have a peace of mind if you are single, with no friends, just living in isolation. They will question your every visitor. They will keep asking why different girls keep coming over. Please note, this is not about your failures as a tenant, it is just the landlords, they are of the people hater party. You can always smell these ones miles away. Be wary of a landlord who asks you to make a deposit so they can instal a water shower before you move in. These broke landlords are as informal as they come. They will call you in April and request you to pay for the month of June in advance. Or they will request you to pay half of next month’s rent so they sort out some personal problem. You are their bank, they are basically asking for loans, disguising them as rental advances. The only advantage of these ones is that they need you more than you need them. They will let you get away with many ‘crimes’. Some will even request to be your ‘laundry person’. They are also fond of increasing rent every after six months. You cannot wave your new iPhone in their presence, that will always result in a rent increment. Whereas you have the broke ones, you also have the sponsors, the big daddy and big mummy, the ones who understand the language of money. Once in a lifetime, you need to have a sponsor landlord. If you fail to build your own house while having a sponsor landlord, then you need the intercession of a prophet. Imagine having a landlord who forgets your rent debts. After clearing your rent, they will ask for a reminder about the specific month. They are always improving the life at your apartments. They are installing more water tanks, acquiring the services of professional guards. They are not dependent on the rentals. It is as though they build houses as a charitable act. On behalf of all tenants, we seek the Lord to grant us more of this type. Action-oriented, have zero tolerance for nonsense. They are silent volcanos waiting to erupt. You do not want to mess with these landlords. They act on their word. If they tell you to go, it means vacate the house immediately. They will not send you a monthly reminder. They will leave you to take their generosity for granted, then wake up and throw your things out. If you doubt me on this one, kindly ask Fabiola. They will always call the media as they throw you out. To all tenants reading this, always pay on time. If it means going hungry, do that. That said, if this piece spoke to you, maybe you have been renting for far too long. You should consider getting your own house. And for my dear landlord reading this, these views do not reflect the views of your humble and committed tenant. They should not be used against him in any way! Miss Curvy Contest: Shall I stand mute while a gaggle of tourists admires me from every angle?